Barcelona are interested in signing the Brazilian in this January transfer window. 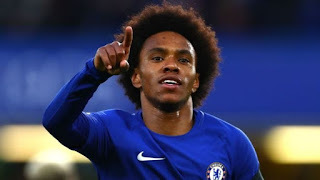 But speaking after Chelsea’s 2-1 victory over Newcastle United in the Premier League encounter at Stamford Bridge on Saturday night, Willian stated categorically that his future remains at Chelsea. The 30-year-old scored the winner against Newcastle following Pedro’s first half goal. On his decisive goal and the win over Newcastle, Willian added: “I think it’s always difficult in the Premier League. We have to be more clinical. Today we couldn’t do that but we have the quality to do it in the next games. Meanwhile, Chelsea manager, Maurizio Sarri has dismissed reports linking Willian with a move away from the club. The Italian gaffer said it is “impossible” for Chelsea to allow the forward to leave the West London club this month.